Anniversaries are really extraordinary. They only occur every 12 months. It isn’t just a commemoration of love, but of understanding, dedication, and compromise. Getting to an anniversary is hard work and should therefore be commended with a gift that doesn’t fall short of extraordinary. Anniversary gift baskets are designed to do just that. Regardless how many years you’re celebrating, you can easily find the perfect anniversary gift basket that shows how special the event is. Classy and generous, this spectacular design is abundant in sophisticated tastes. Artfully arranged in a specially designed basket, your recipient can get dessert wines, a Cabernet Sauvignon and a Chardonnay, not to mention the flavorful foods to go along with them. Enjoy handmade summer sausage, wafer cookies, and gourmet cheese. This delightful gift is guaranteed to impress no matter the occasion. No matter what is being celebrated, this exquisite gift basket is sure to impress. Inside an elegant basket, your recipient will have choices of exquisite sparkling wines nestled among a collection of sophisticated treats. Include sinful French truffles, dark chocolate squares, wafer cookies. This arrangement makes a wonderful gift that’s totally unforgettable. Make a good impression at any occasion with a chocolate gift basket. Inside a gift basket, your recipient will get a tempting array of gourmet foods like smooth chocolates, tasty cookies, chocolate wafers, and chocolate covered cherries. This incredible gift is absolutely irresistible. This generous basket gracefully complements any anniversary celebration. Inside the basket, your recipient will find a complex Cabernet Sauvignon and a crisp Chardonnay, and a variety of classic gourmet treats like wine wafers, aged cheddar cheese, and summer sausage. This gift basket is the perfect present for any celebration. Make a lasting impression at any occasion with this premium chocolate gift basket. Inside one of our signature woven baskets, your recipient will discover a tempting collection of gourmet foods that includes sophisticated treats and silky chocolates. Complete with a variety of decadent cookies, chocolate drenched cherries, and delectable chocolate wafers, this exquisite gift is completely irresistible. Most groomsman and groom gifts are tedious. Most gift basket companies want to provide only the best gifts for men so they are handpicking and creating some of the best personalized groom and groomsman gift baskets out there. What do men do at bachelor party’s? They drink! A lot! And what are most bachelor gifts missing? Alcohol! Groomsman and groom gift baskets are perfect gifts for bachelor parties. They are filled with all the beer, booze, cigars, and snacks that will make your bachelor party one to remember, or at least one they can barely remember. 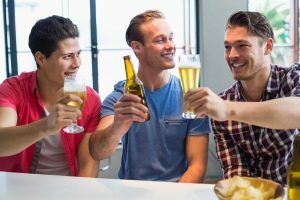 The best thing about our groom gift baskets is they can be delivered right to the bachelor party, hotel, or hall so they can show up to a bachelor party in a box. A beer gift basket is the supreme groom and groomsman gift. It usually includes a custom beer bucket, a wall-mount bottle opener, and a personalized beer mug or pint glass. Put in a bottle or two of craft brew and you have groomsmen/groom gift ideas you won’t find nowhere else. Quite frankly, any manly items will do. Just let your imagination go and you will soon have a list of things that only gentlemen can enjoy. But it is important to remember that these gift baskets are also for a wedding, so use so tact and be creative! Weddings are a happy time for everyone entailed, as well as the bride-to-be and the bridegroom. They are probably happy for the coming day to show up so they can claim “I Do” in front of others. If you have ever participated in a wedding celebration, you will certainly understand that it is an absolutely joyous time for every person seeing the couple marrying. When it comes to the wedding party, however, lots of people have a much more enjoyable time because they are able to loosen up. Gifts galore await the new bride and the bridegroom at the wedding reception. If you have ever bought any type of wedding present, you have likewise spent countless hours aiming to consider exactly what to get the new bride and groom. If you have never thought about offering them a wedding gift basket, these can be remarkable presents for any couple. There are all type of ways in which someone can be creative with their wedding gift basket. 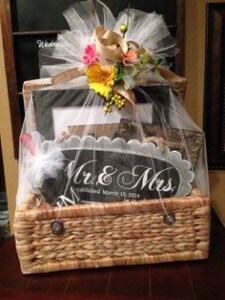 From making the actual basket on their own, to making sure that they put in everything unique right into the basket, wedding gift baskets are great presents to due to show your love and support. A few of the friendly items that you might wish to consist of with the wedding gift basket is bath items. Bath items are typically well obtained and there are a plethora of alternatives available as well. In addition to bath products, there are a lot of other points to include with a wedding gift basket. For starters, how about putting in some things that they’ll need for their kitchen. Unless one or both of them owns a house with a fully-stocked kitchen, they’ll need a few things to get them going. As an example, spices,natural herbs, coffee, and teas smart ideas to add to the gift basket. Nonetheless, natural herbs, coffees, and teas must not be the only thing in a wedding gift basket. You can also add some kitchen items that they’ll most likely need too!